This Mexican-inspired meal is a symphony of bright flavors and contrasting textures. 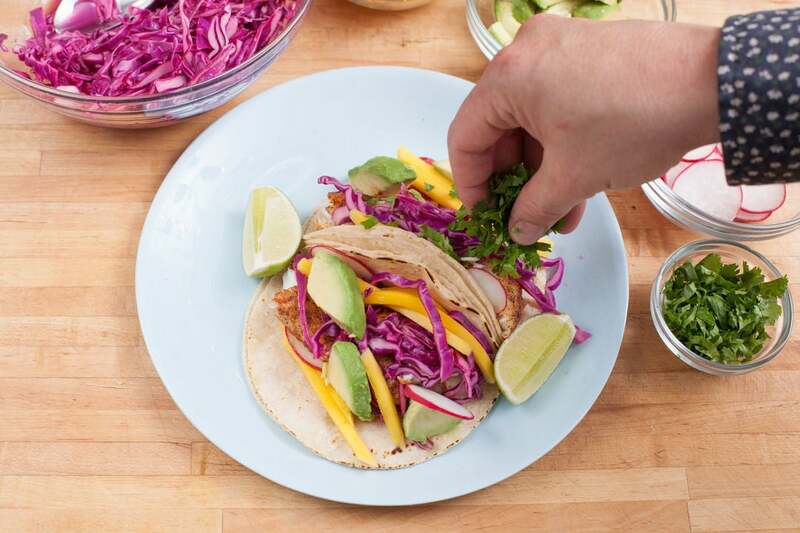 The fresh cilantro and lime bring out the creaminess of the avocado, while the pickled cabbage and the spicy radish add snap and crunch. 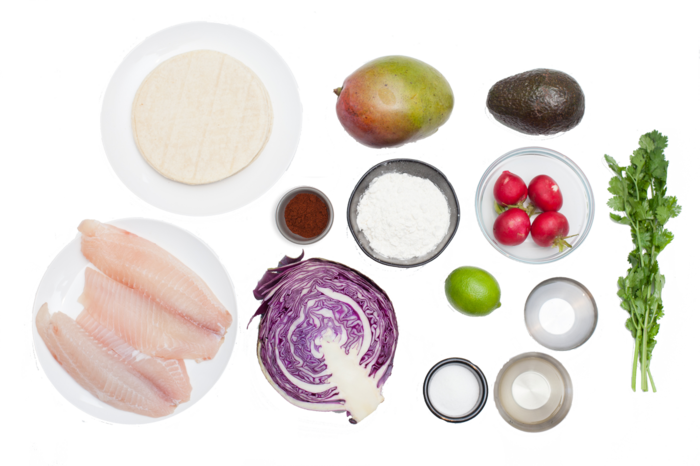 All of these sensations complement the flaky and tender tilapia fish. 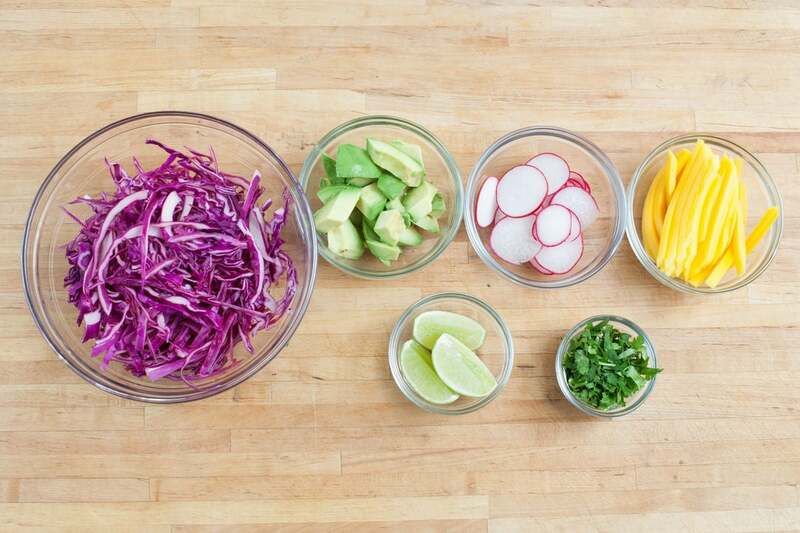 The final product—a colorful dish fit for a fiesta that we hope you’ll enjoy. Wash and dry the fresh produce. Cut the lime into wedges. Pit, peel, and cut the avocado into bite-sized pieces, then season with salt and squeeze the juice of one lime wedge over it to prevent browning. Thinly slice the radishes into rounds. Thinly slice the cabbage. Roughly chop the cilantro. Peel, pit, and thinly slice the mango. 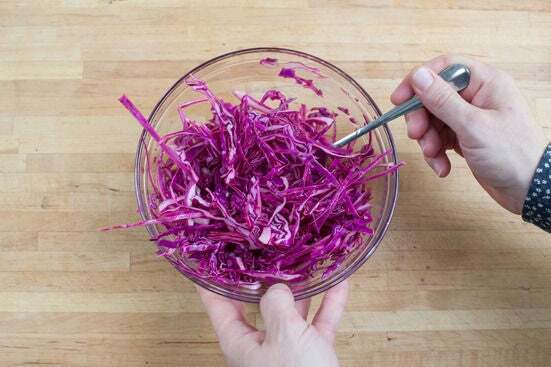 In a small bowl, combine the cabbage, rice vinegar, and mirin; season with salt and pepper. Let stand while you finish cooking, stirring occasionally. Pat the fish dry with a paper towel and season with salt and pepper. Coat the fillets with a very thin layer of the Mexican chili powder (use less if you’re not a fan of spicy foods), then the flour (shaking off the excess). In a large pan, heat a layer of olive oil on medium-high until hot. Add the fish to the pan; cook 2 to 3 minutes per side, or until golden brown and cooked through. 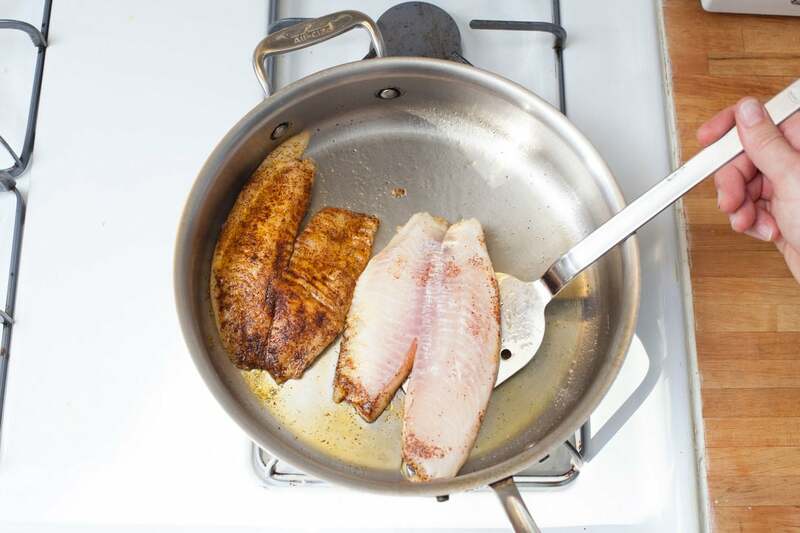 Transfer the fish to a paper-towel-lined plate. Wipe out the pan used for the fish. 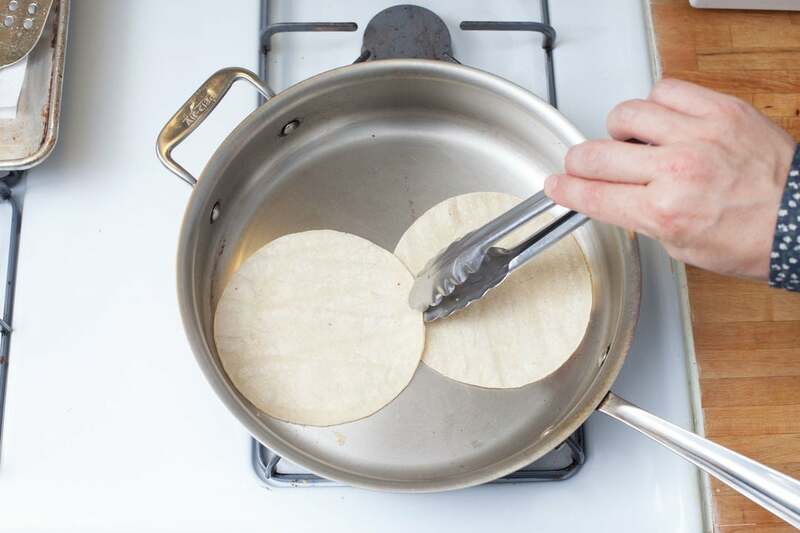 Working in batches, add the tortillas to the pan and heat on medium-high 30 seconds to 1 minute per side, or until soft and hot to the touch. Transfer to a plate and cover with a damp paper towel to keep warm. Make 4 tacos with 2 tortillas layered together for each. 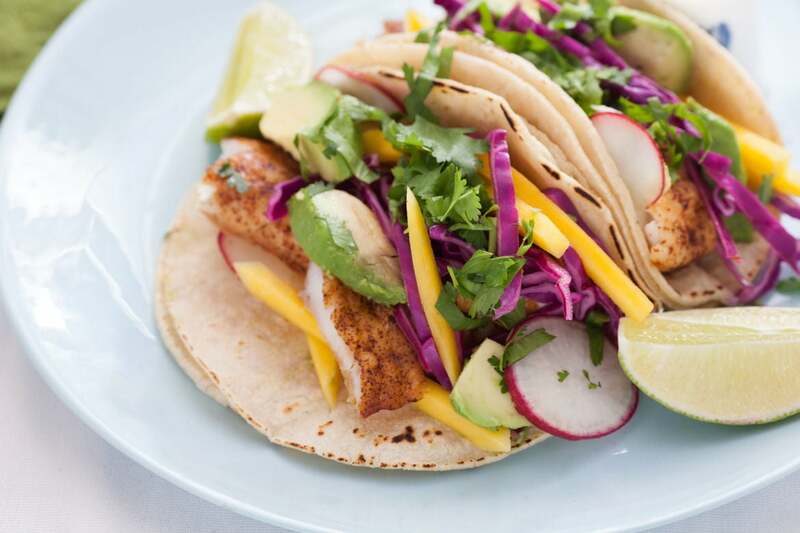 Divide the fish between the tacos and top each with avocado, radishes, pickled cabbage, mango, and cilantro. Drizzle a little liquid from the pickled cabbage over each taco and serve with the remaining lime wedges. Enjoy!